Southwest Florida Ambassadors Nancy Meyer and Cindy Eddleman were recently invited to the corporate headquarters of Diplomat Specialty Pharmacy in Flint, Michigan. They were asked to introduce Pickleball to the IT Department as a team building activity on December 12-15. 2011. Diplomat Specialty Pharmacy set up two pickleball courts inside the building, using painters tape and the USAPA portable net systems. This company has grown significantly in the past two years and they have many employees who do not really know each other. We were asked to do a clinic one day, and allow a practice timee after work hours, for those who were interested and then set up a round robin tournament for Wednesday. Diplomat paired the employees into teams for the tournament, pairing employees who did not work closely together on a day to day basis. For example, a software specialist with a hardware specialist. This formula seemed to work out perfectly as employees played together and helped each other out duringboth the clinics and the open play. 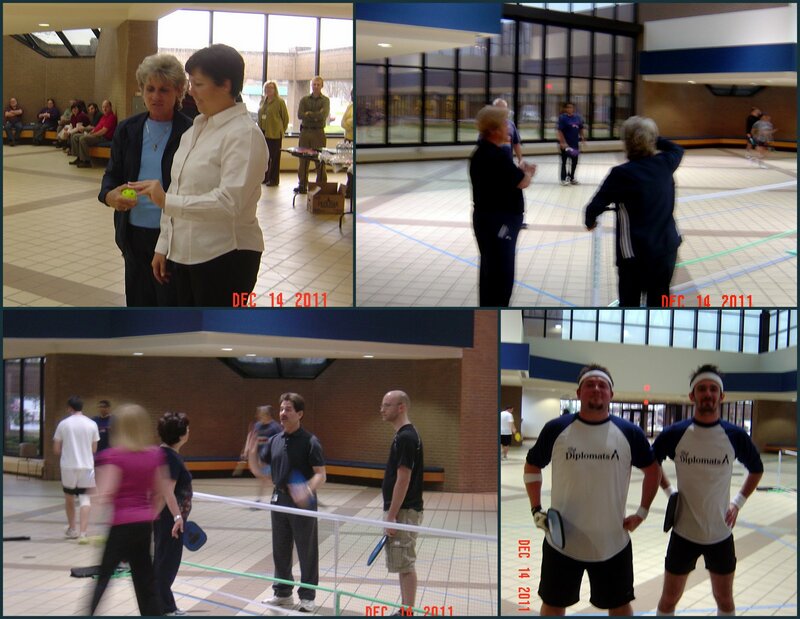 The first day, Tuesday, was an introduction to Pickleball since not many of tthe employees had ever heard of it before. One and one-half hour clinics were held during the day to teach basic strokes, scoring, etc. Everyone seemed to have a great time so we invited them to practice with us after work hours on Tuesday night. We did four one and one half hour clinics on Tuesday and several half hour “quick clinics” and the open play was from 5:00 pm to ??? on Tuesday night. We had no idea how many would actually stay after work for open play, but we were stunned when both courts were full and 12 more people were waiting to play. Wow!! Finally, after a very long day, at 8:00 we had to initiate closing up shop for the day. On Wednesday, we had two round robin tournaments that included all the clinic participants from the day before. The winners from each tournament played in a finals at 2:30 on Wednesday. The company awarded gift cards and prizes for the winners. The IT Department had been promised a Pizza Party for all participants that scored at least two points during the tournament. Needless to say, they all scored two or more points during the competition. The IT Department used this as a team building and fitness event. Other departments in the company were invited to several “quick clinics” during the day on Tuesday so that they could be introduced to Pickleball. All of the company executives participated in the clinics and really enjoyed seeing their employees compete and work together as a team. Diplomat Specialty Pharmacy has left the two courts set up for employees to use during lunch, breaks, and after work. The IT employees have been teaching other departments how to play, and they are now working on organizing a league on Tuesday and Friday nights. A congratulatory email was sent to all the executives at Diplomat Specialty Pharmacy by Jeanne Ann Stasny, Vice President at Diplomat and the visionary who thought that Pickleball might be the one thing that would bring her team closer together and produce positive work results for the company.